how are you today? My headache is here for TWO long days, oh... BUT.. I made video tutorial for YOU "how to crochet barefoot sandals" yeeeey... Great handmade project for last summer days - it's really quick - I made a pair of barefoot sandals in one an hour. It's really quick tutorial for pre - intermediate crocheters or better beginners. - thin acrylic yarn in nice summer colour, I have light turquiose, I guess, that's great summer colour, but you can use yellow or pink..., it will be certainly beautiful. And here is video tutorial - subtitles in english, but you don't need to understand, you will see everything in this video. Cool... If you like this tutorial, like, comment and share it please :). 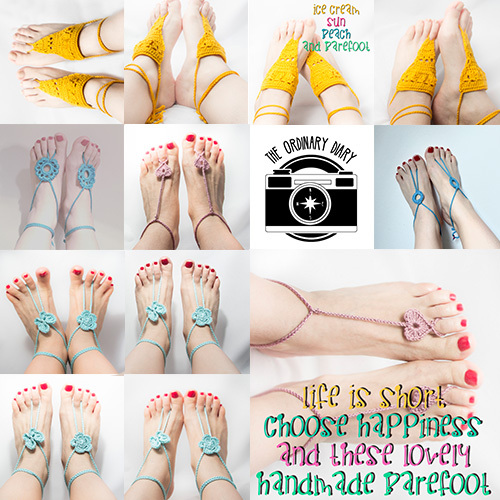 Barefoot sandals in our Etsy shop - find them here.